Why we must save the planet from our clothes – Steal These Thoughts! You know when you notice something that’s always been there, yet you’ve never really seen it before, like actually knew it was happening? well that was exactly what happened to me a few days back. I try to be in the know as much as possible when it comes to making sure our society doesn’t destroy the planet, I like to think this is an important thing we all take note of. I do the usual stuff as most of us do, I use my recycle bins, I aim to only eat what I need and waste as little as possible, I’ve also given the middle finder to plastic and will be commonly found using tote bags to carry my shopping which also compliments my ever growing hipster look. Basically I try to do my bit, to make sure we aren’t living in a forest of waste and death. Plastic is the hot topic right now and rightly so, yet there is another epidemic that doesn’t seem to get as much attention and that is fashion, particularly fast fashion. I watched this BBC 3 show, which was all about the dirty secrets of the fashion industry and how it is the second biggest polluter on our planet(yes, you read that write the 2nd biggest only beaten by the coal and oil industry). To say I was shocked by what I watched is a understatement, to be more accurate I was scared shitless!! my jeans are literally killing the planet and it has changed how I will shop from now on. So, lets talk about some of the things that terrified me and what you need to know too, as we are all in this together people and we only have one planet. As touched on in the BBC doc, cotton is regularly marketed as a clean, fresh and natural solution, yet it seems that it’s actually one of the most unsustainable crops on the planet because of it’s thirst for water and more chemicals. So why is it that so many brands are marketing cotton as a clean, Eco friendly solution, when in reality it’s the big bad? I see so many stores advertising cotton as good for the planet, but really it’s all about it being cheap to make so they make you feel better with a shiny marketing campaign. Sustainability is an even bigger focus today and hopefully we’ll see more brands take a more ethical approach to their marketing and sourcing methods. Some of the harrowing parts of the doc showed what is happening in countries like Indonesia, where factories are pumping a concoction of deadly chemicals into local rivers and land used by local residents. There are kids who are playing in these rivers and families who are drinking that water, it’s insane. The rivers shown were practically black sludge with dead animals floating everywhere, yet these factories seem not to care at all. You read that write, you’re beautiful new jacket has led to the oblivion of an actual sea. In Kazakhstan, the Aral sea was once the fourth largest lake in the world at 68,000km and it’s been drastically shrinking since the 1960’s. As of 2018, hardly any of this lake exists and all that’s left is a barren man made dessert which has contributed to the local villages suffering physically from chemical exposure and the loss of job opportunities that the lake brought to the region. Again, how can we allow this to happen to our fellow humans and planet? All these cheap garment we are constantly peppered with from some of the worlds leading brands are the biggest contributors to this issue. So many of us are going on all out shopping sprees, buying more than we need and not recycling our old garments. You can’t blame all of these brands though, as we are the ones constantly buying more and more, yet would we do this if we knew the consequences to out planet and people? think about that next time you go clothes shopping for the fifth time this month. I’m not saying never buy clothes again or don’t shop, I’m just saying with this knowledge, it’s our responsibility to think about what we are doing and how we can stop being part of the problem. I love fashion and expressing my style through what I wear, but I also love living and being part of a healthy planet. So what the hell can we do about this? I’m glad you asked that and the answer is so much, we have the power and choice to make this better. Just like with the recent plastic movement and reducing our usage of this, we need to do the same with our clothing habits too or we can kiss goodbye to existence. Donate them to a charity shop, take them to a recycling centre, swap your clothes or even take them to a high street retailer such as H&M who amongst many others facilitate a “shwop” box to make sure your garment is dealt with ethically. Sounds weird but it’s an emerging trend over the last few years. People are holding swap shops all over the place, always liked that friends jacket and they no longer want it? make a trade and do your bit for the planet. If your garments are beyond repair, you could look to reuse the material to create something new. I recently discovered this website which provides some great idea on how to re-use clothes. You can find just as many ideas through a quick Google search or hop on over the pinterest. Stop buying so many clothes! A simple one really when you think about it and the same with food waste and plastic. Stop buying more then you need, I mean, do you really need 10 yellow dresses or 25 t-shirts? use common sense and see where you can cut down and with anything you do get rid of, remember to recycle. We are just fuelling the problem if we keep buying more than we need and running around on shopping sprees every week. So as we come to the end of this, I hope this has connected with you in some way and please please please!! watch the BBC documentary, it’s an eye opener. I don’t have all the answers and I know there are many people who know more than me on this topic, so I encourage you to do your research and see how we can all play our part in building sustainable fashion. The sustainability of our planet is one of the most important causes we should be supporting, so isn’t time that more of us took notice and did our own part to make the world that bit better. 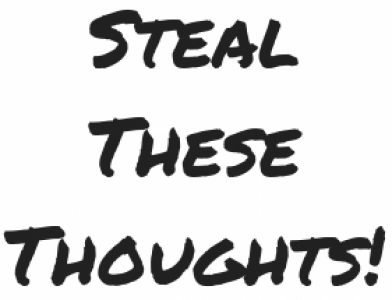 Don’t forget, if you like my writing and would like a weekly dose of great content to your inbox, then signup to my popular Steal These Thoughts! newsletter. Every week I share content including writing, podcasts, interesting links and more. It’s free — no spam, unsubscribe whenever you want.